Build and expand your network with Ubiquiti Networks UniFi Switch, part of the UniFi line of products. The new 8-port models feature Gigabit Ethernet ports in a compact form factor. The switches are fully manageable, delivering robust performance and intelligent switching for your networks. The US-8 can be powered by 802.3af/at, 48V passive PoE, or the included power adapter. When the US-8 is powered by 802.3at PoE or the included power supply, port 8 supports 48V (2-pair) PoE passthrough to deliver up to 12W of power. The US-8-60W is powered by its included power adapter. It has four auto-sensing PoE ports delivering up to 15.4W of power per port. 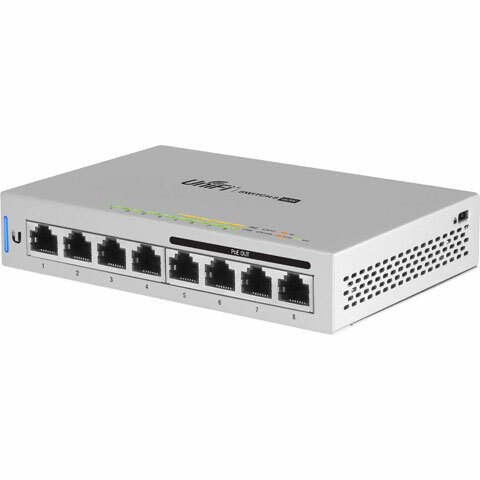 The Ubiquiti Networks US-8 is also known as Ubiquiti	UBI-US8	or US8	.